PODCAST: How to approach Hold'em only vs. mixed games in a home game + #EPTSochi highlights from the Russian cash game tables. In episode 331, Bruce Briggs and Robbie Strazynski examine the issues a player needs to be prepared for when approaching a mixed games home game versus a hold’em-only affair. Robbie recaps his eclectic experiences at EPT Sochi, including some tales from the Russian cash game scene. Bruce’s break-even streak gets broken and he goes gaga for Gonzaga in a brief March Madness aside. Of course, there’s a fun one-outer with which the show will likely leave you chuckling. Top Pair thanks their sponsors, J Design Cards and the Poker Notes Live mobile app for their support. Be sure to check ‘em out! 1:21 Deriving happiness from sesame seed bagels. 3:35 Breakeven Bruce breaks down. Lost two buy-ins over two sessions. Reminiscing about previous April Fool’s Day episodes. 4:56 March Madness talk. Bruce goes gaga for Gonzaga, while Robbie questions the university’s actual existence (with an assist from Jimmy Kimmel). Warren Buffet’s Berkshire Hathaway multimillion-dollar bracket challenge. 13:05 Recapping the highlights of a visit to the 2019 European Poker Tour stop in Sochi, Russia. Getting out of the poker room a bit to see the sights and tour the former Winter Olympics host city. 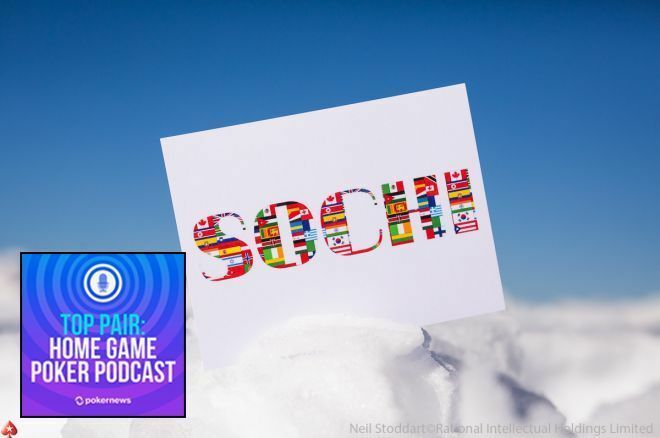 16:18 Talking about what it was like to play in the Casino Sochi cash games. Three sessions for a total of 22 hours of play, but nothing to show for it other than memories and experiences; all that poker and broke even. 18:50 The importance of looking to the left and making adjustments according to how your opponents react to looking at their hole cards for the first time. 21:04 Other notable personalities in attendance, interviews, and trip highlights, focusing on introducing Westerners to what Russia is really like vs. stereotypes. 25:25 Robbie’s heading to the WSOP for the fourth consecutive year, will be entering a bracelet event for the first time, the $1,500 Dealer’s Choice event on June 3rd. Crossing off a bucket list items after 15 years of dealer’s choice home game play. 29:00 Will Bruce and Robbie finally meet this summer? 31:47 No-limit hold’em vs. mixed game home games: what are the main differences in terms of mental preparation and in-game play? Not as many bluffing opportunities in mixed games; multiple reasons why. 42:31 How to estimate what sort of poker bankroll you need and what stakes to play for if you primarily play mixed games, as opposed to mostly hold’em. 53:35 One Outer – Bruce’s friend “Chucky Cheese” exhibits religious fervor at the poker table. You can subscribe to PokerNews’ Top Pair Home Game Poker podcast on iTunes here, or you can access the RSS feed here. Follow the show on Facebook and be sure to join in the conversation on Twitter at #PNTopPair.